Once Jesus was asked by a Pharisee when the kingdom of God was coming. He answered, “The kingdom of God is not coming with things that can be observed; nor will they say, ‘Look, here it is!’ or ‘There it is!’ For, in fact, the kingdom of God is among you.” Then he said to the disciples, “The days are coming when you will long to see one of the days of the Son of Man, and you will not see it. They will say to you, ‘Look there!’ or ‘Look here!’ Do not go, do not set off in pursuit. For as the lightning flashes and lights up the sky from one side to the other, so will the Son of Man be in his day. But first he must endure much suffering and be rejected by this generation . . . (Luke 17.20-37)In this week’s passage, Jesus is once again presenting two options to Jerusalem: nonviolent, enemy love, or nonexistence. These really are the same options that we are faced with today, but that discussion is for another time. With brilliant clarity, Jesus lays out a contingent prophecy of Jerusalem’s destruction and a statement about the transforming alternative to that destruction, saying that Jerusalem’s destruction need not happen. Whenever you enter a town and its people welcome you, eat what is set before you; cure the sick who are there, and say to them, ‘THE KINGDOM OF GOD has come near to you.’ (Luke 10.8-9). When the Pharisee questions Jesus, he is actually challenging Jesus as a “prophet” to present his “revolutionary vision.” What he is actually asking Jesus to do is explain what its look like when Jesus envisions the people being liberated from Rome by Yahweh. 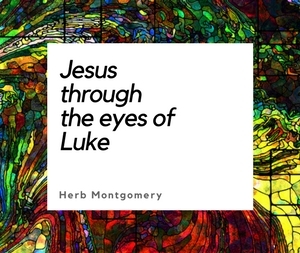 Jesus, in his customary fashion, transforms the question into a contingent prophecy with two potential outcomes: embrace nonviolent love of your enemy and be liberated or remain entrenched in the world of an eye for an eye and retribution looking for a militaristic Messiah and be destroyed. Jesus’ words, “The kingdom of God is not coming with things that can be observed; nor will they say, ‘Look, here it is!’ or ‘There it is!’ For, in fact, the kingdom of God is among you”, contain both their most cherished dreams (the favor of God on Israel) and their worst nightmares (the favor of God also on their enemies, the Romans). Loving one’s enemy and nonviolent mutual liberation of Jerusalem and Rome from the real Enemy was a path that would require Jerusalem to forgive Rome, to love Rome, and to endeavor not only to save itself from Rome, but to save Rome from its allegiance to “the Powers” and encourage Roman to follow the nonviolent, enemy loving Messiah. The potential for all of this was among them and the choice was within them. These were not lunatic leaders, but hopeful militarist messiahs, action prophets who contemporary scholars see as attempting to lead movements of Jewish peasants in active engagements of human effort that would be accompanied by divine acts of empowerment and deliverance. The lie went something like, “Success is dependent on combining human effort with divine power.” If they wanted divine deliverance, they must first present the violent human effort for Yahweh to bless. God would meet their efforts if they acted. The rhetoric of these militaristic messiahs was steeped in the symbols of the Exodus and the Conquest of Canaan. (Much like Augustine’s arguments for marginalizing Jesus’ teachings on nonviolence also centered on the story details of the Exodus and Conquest of Canaan of the Old Testament. For more on this, see part 7 of the series, The Active Nonviolence of Jesus, within the eSight posts of 2012.) Today, this is called Sign Propaganda and is similar to when a politician uses symbols of the American Revolution to inspire a following. The militaristic messiahs of the mid-first century in Jerusalem used this same technique by employing symbols of the Exodus and of the Conquest of Canaan. When Jesus says “the Kingdom is not coming with signs to be observed,” he is emphatically rejecting the specific way in which popular prophets led masses of Jewish people to their deaths at the hands of Roman soldiers. The reference to such leaders becomes more specific when he warns, “They will say to you, ‘Lo there!’ or ‘Lo, here!’ Do not go, do not follow them.” (Luke 17.23) Those who followed these would-be messiahs and used violence, retribution, and retaliation would perish needlessly in horrific slaughters by Rome. The hope that Jesus gives them is of an enemy-loving, forgiving, nonviolent, and yet noncooperative approach, a nonviolent Kingdom that would change the world through embracing a Roman cross, rather than avoiding it or by picking up of a sword. Neither flight nor fight, Jesus offered a third way, a narrow way, a narrow gate that would lead through death to life. It was counter-intuitive, but it was the way of wisdom. The way that seemed right to them [violent retaliation] would lead to their death instead (Proverbs 14.12; 16.25). Luke 6.27—”But I say to you that listen, love your enemies, do good to those who hate you. Luke 6.32—”If you love those who love you, what credit is that to you? For even sinners love those who love them. 2. As you are praying through these passages, I want you to write down any insights that Jesus gives you into ways that you can be a part of healing the world in your daily lives. As odd as saying it this way sounds, the reason the healing of the world is “within our power”, according to Jesus, is because the power itself is love. It is this love that Jesus wants to not only educate us in, but also empower us for. It is a way of life flowing from God’s love for us AND for our enemies. It is an indiscriminant love, showered like the rain and shining like the sun on all creation. This way of life is “within our power” because we can choose to accept God’s transforming love, not just for ourselves, but for our enemies as well. To view our enemies through the lens of what is in God’s heart for them is transforming. It transforms us! And then, by relating to our enemies, it transforms them too! Before long, we have set in motion a contagious chain of events, dominoes tipping upon dominoes, until a world where love reigns is the only world that remains. Regardless of who they may be or what they may have done to us, we must see that within our loving of them, our forgiving of them, our choosing the way of nonviolent love rather than eye-for-an-eye retribution, lies the hope of our world. Like the Samaritan of old, we will be saved by our enemies, specifically by learning how to forgive and love them. They, and the lessons that are related to them by love, are the means of our salvation. God’s love for our enemies is the Kingdom within our power and is there for our choosing, waiting for us to affirm it’s divine power, the divine power of agape, and to begin experiencing it. Through our enemies, we meet the heart of God’s love and the possibility of salvation from the way that leads to death. In the movie of Gandhi’s life from 1982, there is a scene where a Hindu is conscience stricken over his own violent slaying of Muslims. Gandhi offers him a way out of “hell.” Gandhi tells the Hindu to find a Muslim child who has lost their parents due to the violent fighting of the civil wars between Muslims and Hindus and to take that Muslim child into his home, his family, his heart and to raise him, not as a Hindu, but as a Muslim. I wonder what forgiving your enemy will look like? We’ll continue next week with prophecy number 6.